“More beach for your blanket” is the boast of Brunswick Islands in North Carolina, minutes from the Wilmington and Myrtle Beach airports. Enjoy laid-back quality time with family and friends withou t the distractions that major attractions can bring. There’s more golf for your game as well with over 30 courses. Cape Fear National at Brunswick Forest has a superior layout, a bit reminiscent of TPC Sawgrass. Number 13 has a bunker running through the whole fairway. Far right drives may cross the unseen railroad tracks and hop a boxcar to Fayetteville. Left leaning drives hit the water for gator food. It turns out the waste bunker is a benign strategy since you can ground your club and chances are the lie will be as good as in the target fairway. This natural habitat for any living creature with tall pines, ponds with white lilies and blue water iris begs for Monet to arise with his paintbrush. When you hear designer Tim Cate, think first rate. Designer Dan Maples’ 27 holes at Sandpiper Bay and Golf Club are graced with more mature, full towering pines. A Floridian style with nice routing of holes through the community, this is great gator land with lots of babies along the waterways and big daddy lounging right by the ladies’ tee box on number nine of the Bay course. The Magnolia and Dogwood Courses at Brunswick Plantation and Golf Resort are as pretty as their names. Azaleas and other floral lead to the waterside wedding arbor for photo ops. The layout is challenging with interesting use of water features including oyster shell shorelines on a couple ponds. Go during an “r month” to taste these live native treats. Enjoy libations after the round at the clubhouse bar or walk home to the Brunswick Plantation Villas, spacious and homey with a serene balcony. 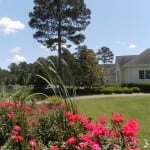 The Ocean Isle Inn is another great home base option for families or golf groups on a perfect beach setting. Simply supplied, this is about location, location, location – very relaxing. Also relaxing is a day at sea with the Hurricane Charter Fleet. Everyone should experience “the three hour tour” at least once in life for a very different perspective. Sharkey and crew will take you out of sight of shore or other boats, where dolphins dance above and fish wait below. “Lower your reels” is the call of a shotgun start of derby fishing. The strikes come fast. 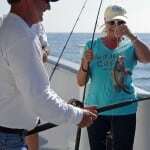 Sea bass, lady fish, ring tail and a shark were hoisted aboard. Are you squeamish about baiting squid on the hook? Not to worry as the crew does it all for you, bait and release. Caution though if you catch too many, the arms might be sore later. In season, the catch can be cleaned and cooked or head to a local restaurant instead for their catch of the day. Seafood dining is the region’s obvious specialty. At Sharkey’s on Ocean Isle Beach, the conch appetizers are the big hit. Owner Ray has been in the area for generations, serving real estate needs as many tourists relocate here. When asked how the north and south population mingle, he said, “There are Yankees and then there are Damn Yankees.” Touché for all sorts of people. At Captain John’s Seafood in Calabash the snow crabs platter is more than one can handle. At Twin Lakes Seafood in Sunset Beach, the whole flounder was blackened just right as recommended by tourism chairman Kemp and his wife Brenda whose dining company delivered old time Southern Charm, wisdom and humor. By morning the arms are ready for more golf and so is Farmstead Golf Links with a tough but fun run crossing North and South Carolina borders. Head Pro Jason assures that customers are top priority. Five sets of tees allow golfers of all abilities to enjoy this great layout. Finish with another Tim Cate design at Tiger’s Eye. The moment you enter the Ocean Ridge Plantation expectations accelerate. No kittens here; this is where the Big Cats play at Lion’s Paw, Panther’s Run, Jaguar’s Lair and Tiger’s Eye whose southern plantation veranda overlooks the stunning panorama of the closing nines. Wild and untamed, this family of felines provides its own unique style as represented in the clubhouse’s authentic display of cats in hats. Early day pirates missed the boat in the Brunswick Islands as the real treasure lies in the many miles of sandy beaches and beautiful forests. Spread your blanket in a great spot for vacation or retirement. See www.ncbrunswick.com.